It’s time once more to head to the lands far to the east to check out an online slot themed on luck and the acquisition of gold; it’s name is Master Chen’s Fortune, it’s developed by Pragmatic Play and it comes with paylines in both directions to help part Chen from his piles of money. 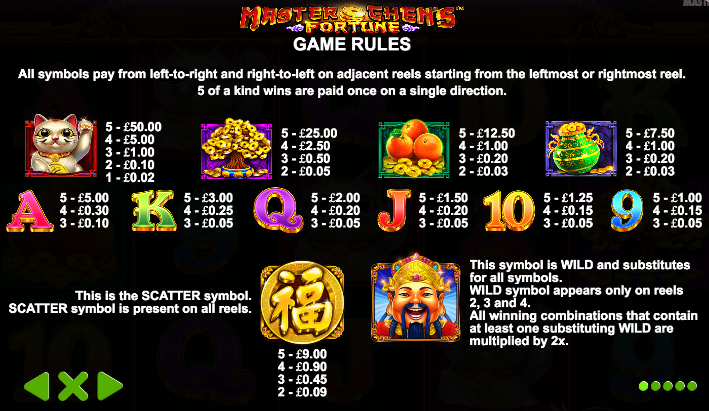 Master Chen’s Fortune is a five reel slot with three reels and nine fixed paylines; Chinese music accompanies your gameplay which takes place on an ornate, gold-rimmed set of reels full of some familiar oriental symbols. The high value symbols include the famous Maneki Neko waving cat, a bonsai tree growing gold coins, a pile of oranges on gold coins and a green vase overflowing with gold coins (Master Chen has lots of gold coins); 9, 10, J, Q, K and A make up the lower values. The smiling Master Chen is wild, he appears only on reels two, three and four and he will substitute for all others to help form winning combos except for the gold scatter symbol. He will also multiply any wins he helps out with by 2x. The scatter symbol will pay if you can land at least two anywhere in view. We can’t really say that there are any bonus features in Master Chen’s Fortune but the interesting gameplay feature is that wins can be formed from right to left as well as left to right as long as there are matching symbols in adjacent reels starting from that side. 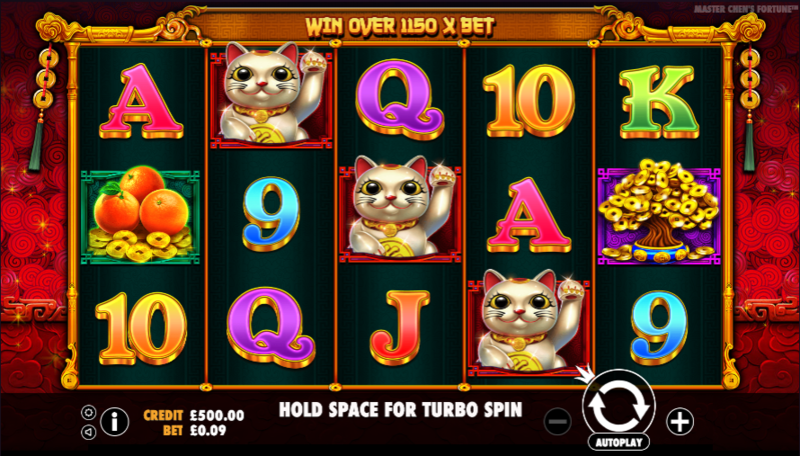 If you’re put off by a lack of bonus features than Master Chen’s Fortune probably isn’t for you but for everyone else this is a high quality slot with top notch graphics and some engaging gameplay. It’s entertaining and it comes with an RTP of 96.48%.